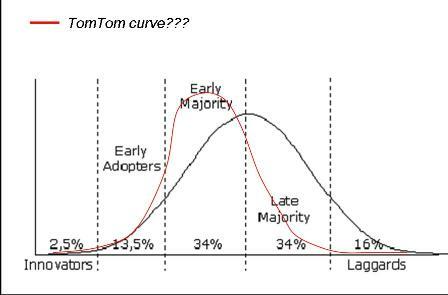 I don’t think the adoption curve (innovators, early adopters etc.) is completely accurate anymore – its become a more dynamic model. Take Tom Tom. I suppose I’m an early adaptor/early majority type and I bought into portable sat nav last year after getting lost once too often. After it got me to a city I’d never been to before, round five trade counters and back home again without getting lost, I was a total convert. So I lent it to my Dad (who is in his early 70s and still doesn’t know where the ‘on’ switch is on the computer). He discovered that he didn’t need to strain to read road signs in the dark with satnav. Another convert, probably 12 months earlier than he would have otherwise bought in to it. So he told all his sixty and seventy-something friends how fabulous it was and they discovered that you could pick the ‘no motorways’ option and have a lovely country drive to your destination. So because I brought the technology into our family, my Dad’s social network went backwards up the adoption curve, but only in this case, for this product . Which means that the strength and relevance of the connections and networks of the left hand side of the bell curve define how steep the curve becomes, I think.